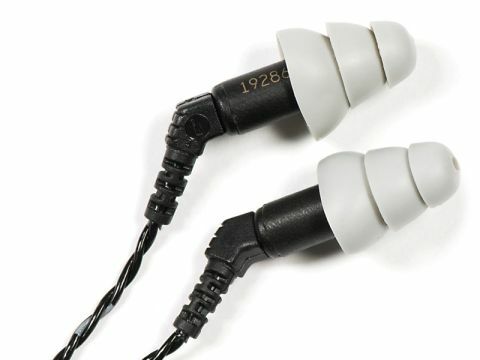 Etymotic was an early entrant in the high-end in-ear headphone stakes, with a background in scientific hearing investigation. For many, the brand has come to be the yardstick for performance, so it was good to be able to include the Etymotic ER-4P model here. The range is not vast and it's not always obvious what the advantages of each model are, though this one is clearly aimed at the portable music market. Its sensitivity is high and it has slightly more bass output than other ER-4 variants, suiting it to what one might call 'mass-market' musical tastes. Four styles of earpiece are supplied, together with replacement filters. One of Etymotic's particular claims is for very high isolation from outside noise and this reaches an astonishing 42dB – in the same ballpark as industrial hearing protectors! This makes for comfortable listening in noisy environments and also ensures practically no music leaks out to annoy others. One feature we've found consistently with Etymotic models is that they are incredibly fussy about positioning in the ear. It takes both experimentation and practice to get this right and until one does the sound is frankly horrid, all upper midrange and with little detail. Once the perfect fit has been achieved, though, everything changes dramatically, so persevere! It may say something about other in-ear headphones that even this 'enhanced bass' model didn't seem remarkably bass-rich, though comparison with over-ear headphones did suggest it's just a shade lifted. There is also a slight lift in the presence region, but what's most noticeable about the ER-4P is the extraordinary amount of detail it reveals about recordings. It is analytical to a degree that some may find almost oppressive and it will tell you all about the quality of the source too – poor MP3 files are revealed in all their questionable glory. For purist audiophilia on the move, hard to beat.